This is a truly superb little amp, and for all-out rawk, it's the ultimate practice tool. Valve feel. GN'R tones. Celestion speaker. Switchable power. Guns N' Roses' Appetite For Destruction is one of the greatest rock albums of all time, and among its myriad highlights is the gorgeous guitar tone of the band's top hat-totin' whirlwind, Slash. He used a rented Marshall 'Plexi' head and a non-Gibson Les Paul to produce a sound that was full and thick for rhythm, yet sufficiently articulate for solos. And now, after working together to bring us the limited-edition AFD100 signature head back in 2010, the Marshall team and Slash himself have gone back to the drawing board to produce a small five-watt combo. "The SL5 is an all-valve package with an EL34 tube in the power-valve section"
The SL5 is an all-valve package with an EL34 tube in the power-valve section, which is significant because most of Marshall's more powerful amps are based around that type of valve - typically, amps with a similarly low output would use an EL84. 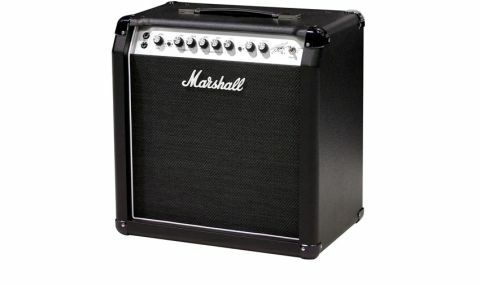 The way the EL34 'squashes' sound is at the heart of the majority of Marshall-based rock tones. The appearance of a 12-inch speaker - a single Celestion Vintage 30 - also gives the sound more body than the amp's diminutive size would suggest. Control-wise, it's business as usual: two channels, labelled clean and dirty, are controlled by a global three-band EQ, and they can be selected either via a button on the front panel or with the included two-way footswitch. The second switch engages the spangly onboard digital reverb. However, one of the amp's major selling points can be found around the back: a switch that lowers the output from five watts down to one. Reducing the output in this way means you can crank the amp to maximum for a super-fat tone - all at bedroom-friendly volumes. So, does the SL5 make you sound like Slash? Well, since a player's tone partly resides in their fingers, it's not as easy as that, but GN' R riffs do sound convincing. You'll need a guitar with a humbucker in the bridge, and to get even closer, tune it down half a step, too - but the breadth of rock tone the SL5 provides is stunning. "If you get bored of trying to nail the intro to Sweet Child O' Mine, it can also pull off lower-gain AC/DC-style sounds with aplomb"
This is a classic British overdrive: there's no crystalline edge familiar from US styles of distortion, and each string can be heard no matter how thick your chords are. Plus, if you get bored of trying to nail the intro to Sweet Child O' Mine, it can also pull off lower-gain AC/DC, Led Zep and Randy Rhoads-style sounds with aplomb - and if that doesn't make you want to play guitar, nothing will. The SL5 won't be loud enough to gig with, but when we fed it through a 4x12 cab, the projection was vastly increased. Still, at the other end of the scale, with just a single watt of output, you can flail away with as much gain as you could possibly want, without bothering your neighbours next door or downstairs. Trust us: although it's close these days, you won't get quite the same style of spongy tone with a digital modelling amp. It's about the feel as much as the sound, and the SL5 has that down. It's not especially cheap, but great things rarely are.